Distressing scenes of the destruction of ancient artefacts by ISIS in the Archaeological Museum in Mosul in northern Iraq have been widely reported in recent days. Video footage (see below) showed individuals wielding sledgehammers at ancient statues which the perpetrators claimed were images of gods. The exact identification of the destroyed artefacts is speculative, but most of the destruction appears to have been wrought on statuary of the Assyrian period (1365 BCE–609 BCE) and from the ancient trading principality of Hatra. These items would be too difficult to smuggle out to the international black market for antiquities, a practice which ISIS appears to have been employing for smaller looted items from museums and archaeological sites across Iraq and Syria. A number of rich archaeological sites lie in the immediate vicinity of Mosul and some of these rank among the most significant yet discovered in the Middle East. Nimrud (ancient Kalhu) and Niniveh were successive capitals of the neo-Assyrian Empire (911 BCE-609 BCE) the latter thought to have been the largest city in the world in the seventh century BCE. 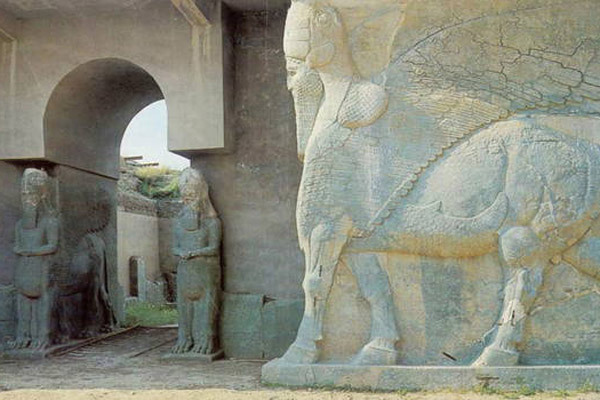 The remains of Nimrud lie approximately 30km to the south-east of Mosul while those of Niniveh are located on east bank of the Tigris in the immediate vicinity of the city. Foreign excavations of both sites began in the 1840s and many impressive items of statuary, architecture and other sculptures were transported to museums including the British Museum and the Louvre. Some of this material stayed in Iraq where it is still held at museums in Baghdad and Mosul. Mosul’s occupation of a strategic crossing point of the Tigris River for many centuries means that the city has a rich history, reflected in the museum’s holdings and the, until recently, diverse population of the city. Mosul was a key crossing point for invading Parthian, Persian and Roman armies from the first century BCE to the seventh century CE and it formed an important trade connection between northern Mesopotamia and Syria, especially with the wealthy trading principality of Hatra (first century BCE – third century CE), some 90km south-west of Mosul, and the more distant trading emporium of Palmyra in central Syria. Mosul was also an important trading centre during various Islamic Caliphates and in the Ottoman period. Today it is the second largest city in Iraq and its bridge across the Tigris is an important part of connecting the whole region of northern Iraq and eastern Syria, which ISIS controls. While the destruction of ancient artefacts in Mosul is without question cultural vandalism at its worst, ancient cultures in Iraq and elsewhere were equally capable of cultural vandalism, often on grand scales. When the Assyrian empire disintegrated towards the end of the seventh century BCE, Nimrud was sacked and levelled by an alliance of enemies including Babylonians and Persians. In 330 BCE Alexander the Great looted the ancient city of Persepolis in Iran and burnt its palace to the ground in a drunken rampage. Roman Emperors and Persian Kings besieged Hatra on five occasions in the second and third centuries before it was finally captured and mostly destroyed while the destruction of Jerusalem by the Romans in 70 CE resonates to this day. There is a clear distinction, however, between the devastation of priceless cultural items by ancient powers and the targeted destructive activities of ISIS. The vandalism perpetrated in the Mosul Museum is part of a targeted program of desecration and devastation undertaken in Mosul by ISIS since it overran the city in June 2014. Reports of the demolition of six Shi’ite mosques and four shrines to Sunni and Sufi figures emerged in early July last year and later that month the 14th-century Prophet Younis (Jonah) shrine and associated mosque were blown up. The obliteration of other Islamic monuments and places of worship has continued while the Chaldean and Syrian Orthodox Cathedrals were occupied after the vast proportion of Christian residents fled the city. Reports emerged in late February that the Mosul Public Library had been ransacked with approximately 100,000 books and manuscripts burned. These actions are directly linked with the adherence by ISIS members to the Salafi movement, an extreme branch of Islam which views the centuries of development in Islamic theology and thinking after Mohammed as accretions which have polluted the faith. The veneration of saints’ tombs and images is a particular problem for Salafists, which explains the destruction wrought on Islamic monuments in Mosul. It mirrors the destruction of saints’ tombs in Mecca and Medina in the early 1800s when Salafists captured the holy cities in what is now Saudi Arabia. The destruction of artefacts depicting what are claimed to be gods in the Mosul Museum is part of making a broader statement to the Islamic world while enforcing an extreme doctrinal position in the city. It is also part of a message aimed more broadly at Iraq and the West. On the same day that the video was released, the National Museum in Baghdad reopened after 12 years of painstaking effort to rebuild it following the looting which took place during the US-led invasion in 2003. The reopening of the museum is a moment of national pride for a country whose very existence is under threat. The destruction of artefacts in Mosul sends a clear message, reflective of the intent of ISIS, which is to destroy whatever stands in the way of its ideology. The release of video footage of this vandalism has other purposes as well, especially with regard to the West, where museums and the precious artefacts they hold are treasured and sacred. Peter Edwell is a Senior Lecturer in Ancient History at Macquarie University, This article was originally published on The Conversation. Read the original article. 6 March 2015 – The United Nations agency mandated with protecting cultural heritage around the world today strongly condemned the destruction of the archaeological site of Nimrud in Iraq, deploring such “criminal chaos” as yet another attack against the Iraqi people. “Nothing is safe from the cultural cleansing under way in the country: it targets human lives, minorities, and is marked by the systematic destruction of humanity’s ancient heritage,” Irina Bokova, Director-General at the UN Educational, Scientific and Cultural Organization (UNESCO), said in a statement.